Multiple studies show a clear link between businesses that attend to their employees’ well-being and the bottom line. In fact, the profit of companies with the strongest focus on employee experience is about four times higher than the average. And yes, you read that correctly - not customer experience, but employee experience. Because if you take care of your employees, they will take care of your customers, and your shareholders will do well, too. How to Build a Thriving Workplace: A Leader’s Guide will tell you how to identify and implement relatively simple and inexpensive changes to improve your employees’ work environment and positively impact your bottom line. Professor Beth Cabrera, organizational psychologist and Senior Scholar at the George Mason University Center for the Advancement of Well-Being, provides a step-by-step guide to creating the best possible work environment for your employees to thrive, based on the relatively new science of positive psychology. She will discuss the benefits of mindfulness training, developing positive attitudes, creating a sense of meaning, work relationships, employee autonomy, and more - and how they lead to a thriving workplace where employees are more creative, engaged, and productive. 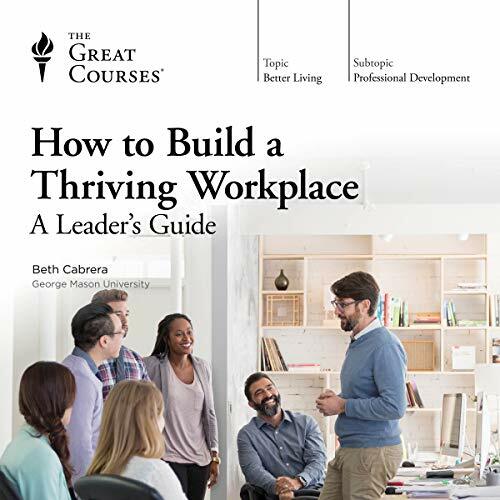 How to Build a Thriving Workplace: A Leader’s Guide will give you all the information you need to transform your workplace into an attractive and thriving environment. In the process, not only will your bottom line improve, but so will the lives of your employees - and your own life, as well. Good detail. Might be known but spoken about regarding team perspective. I get that studies need to back the detail but that feels repetitive and could be in a notes section. This course was far better than most business books I’ve read (and I’ve read a lot) it makes the book “Dare to lead” look like a joke.